Here’s my latest project designed in Inkscape. My husband has been wanting a vintage gas pump decal on the door that leads from his garage to the house. He did a great job with the house side of the door, constructing a wood skin to make it match the doors in the house. You can take a look here. However the back side was looking less than attractive. I used both my Silhouette Cameo and my KNK Zing to cut the decal out of Oracal 651. Because of its size, I had to piece the main portion of the decal. It looks great, but if I was doing this for a customer, I would probably outsource this portion so as to keep it one piece. Hubby is very happy with the results…. and if he’s happy, so am I! Hi there, You’ve done an excellent job. I’ll definitely digg it and in my opinion suggest to my friends. I’m confident they’ll be benefited from this web site. 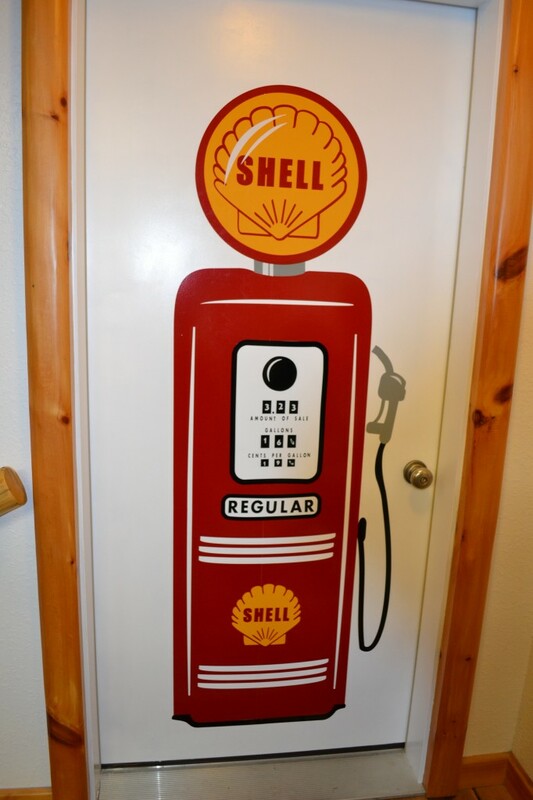 Hi, I love this decal and am looking for something similar but with the Texaco logo. I can’t seem to find it. I know you mentioned you would outsource this if you had to do it again. Where would you go? Sophia…. what I meant was that I would have someone with a larger vinyl cutter cut out the main portion so as not to have to piece it. I designed it myself, but just don’t have a cutter big enough to cut something so big.